Living a Fit and Full Life: StrikeForce's GuardedID® - Maximum Online Security! StrikeForce's GuardedID® - Maximum Online Security! StrikeForce delivers advanced cyber security solutions to people who bank, shop and share information by mobile device or computer. A publicly traded, US-based company founded in 2001, StrikeForce Technologies, Inc. (ticker symbol: SFOR) pioneers technology that protects consumers and businesses in real time against identity theft and data breaches. Their six software patents make them a global leader in cyber security products, military-grade keystroke encryption and out-of-band authentication technology. StrikeForce's GuardedID® is a wonderful product! As a blogger I must have online security that works and StrikeForce's GuardedID keeps me protected at all times. 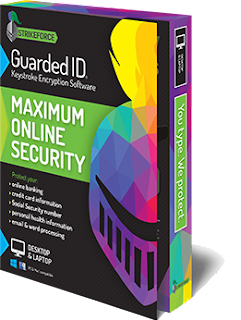 StrikeForce's GuardedID was incredibly easy to install and within a matter of minutes my computer was protected from data theft due to keylogging attacks. StrikeForce's GuardedID encrypts every keystroke as you type so your personal and financial information is kept safe. My computer seems to be working just as efficient as ever and I feel much more confident while online thanks to StrikeForce's GuardedID! Click HERE to learn more about StrikeForce! Follow StrikeForce on social media!